Officials with both the city of New Orleans and the New Orleans Aviation Board announced today (April 11) that the new terminal at Louis Armstrong New Orleans International Airport (MSY) will now open to the public in fall 2019–a delay of several months from the previously announced May 15, 2019 opening. The decision to delay the opening came after officials evaluated the status of all construction activities and consulting with key stakeholders, according to a statement on the airport’s website. Announced in April 2013, the new terminal has been under construction on the north side of the airport property since January 2016 and is now about 95 percent complete, according to officials. 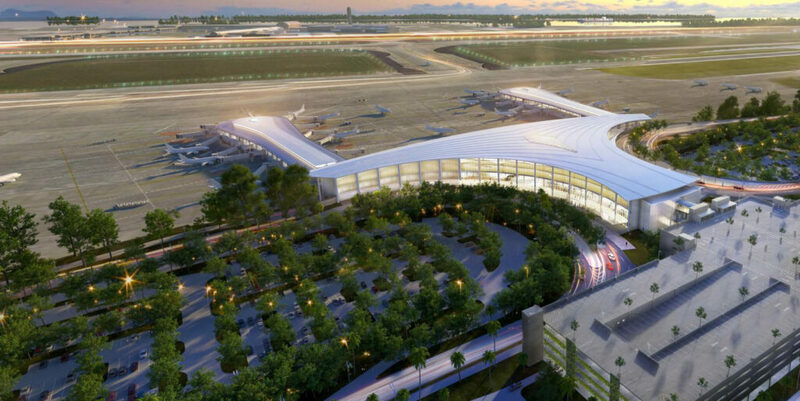 The roughly 972,000 square-foot terminal will feature three concourses, 35 gates, two new garages, a surface parking lot next to the terminal and a remote economy garage with shuttle service. It will also feature modern passenger conveniences like a consolidated checkpoint where passengers will have access to over 40 different food, beverage, news, gift, and specialty retail concessions once they are beyond security. Kevin C. Dolliole, Director of Aviation, calls the new terminal “one of the most significant infrastructure projects in this region’s history. “We want to make sure that we get it right,” he adds. “The additional time is going to allow us to deliver a world-class airport and ensure a safe and seamless transition so that our passengers have the best possible experience,” said . Officials site passenger safety and customer experience as top priorities and the impetus for rescheduling the opening to allow more time for testing, training, and implementation of key systems to transition operations to the new terminal. It will also give local residents time to become accustomed to the new access routes. The existing airport facility is operational, and there will be no impact to flights to and from Louis Armstrong International as a result of the delay, according to the Airport’s statement. Because a move of this magnitude impacts employees, tenants, suppliers, and the surrounding community, the Airport is also planning to conduct real-life passenger trials prior to facility opening. In the coming weeks, MSY will solicit volunteers of all ages and travel experience to participate in trials to be conducted before the opening of the terminal. Anyone interested in participating should visit www.thenewmsy.com to sign up to receive additional information.